Mud – Jeff Nichols – A triumphant exponent of the ‘Matthew McConaissance’ (featuring such other diversions from his ‘comic’ past as Magic Mike, Killer Joe and The Paperboy), this atmospheric film deals adeptly in the American tradition of outward-bound boy adventures. 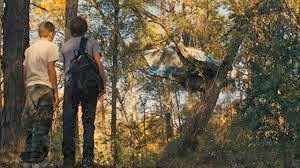 After discovering Matthew McConaughey as a fugitive living off the land, his makeshift house a boat - inspiringly suspended in the trees, two boys decide to help him evade the law and reunite with his girlfriend (a ‘diamond in the trailer-park rough’ Reese Witherspoon). The young protagonist, Ellis (maturely played with nuance by Tyler Sheridan), is experiencing his parents moving towards divorce and the potential loss of their houseboat, consequently the encounter with ‘Mud’ presents a romantic alternative to life: still with a belief in love and living in harmony with the natural world that forms the, now threatened, backbone of his houseboat home. Ellis’ father, played by Ray McKinnon, red cap perpetually pulled down over lank, greasy hair, imbues his character with a vulnerable tragedy in which a grim acceptance of life’s lot – his failed marriage and the impending loss of a home – perfectly counters Mud’s childlike and heroic romanticism. Between these two flawed poles of masculinity Ellis attempts to negotiate morality and maturity, the spectre of adolescence looming over his (and the film’s) impulse for childhood escape.